In Add Notes mode notes can be added by leftclicking the mouse. The dropdown list next to the Add Notes mode button determines the duration of notes being added. Keeping the S or F key down while clicking the mouse adds or subtracts a semitone ('Sharp' or 'Flat'), so you can add notes that are not in the current scale directly. The b and # buttons can be used to transpose the selected notes one semitone down or up. Right clicking a note pops up a menu to (among other things) join the note with the previous note. In order to improve readability notes will be moved horizontally, so notes are spaced nicely without any overlaps. This means that, unlike all other MultitrackStudio editors, the notes don't necessarily line up visually with other tracks. The bar lines, however, always do. In Add Notes mode a one-bar helper grid will be displayed to help you find the position of new notes. You may have to zoom in a bit in order to be able to put short notes (16th, 32nd) at the place you want them to be. The Score editor has a resolution of 1/32nd note. It snaps to the grid automatically, regardless of the Snap setting. Although it is possible to use the Score editor when the time scale is set to seconds, this obviously doesn't make sense. Triplets, quintuplets and septuplets are recognized automatically. Tuplets can be added by right clicking the editor, and picking one out of the items in the menu's Add Tuplet section. Alternatively you can add a note and use the 'More...' button's 'Split in equal parts' option. The section on the left shows the clef and the key signature. Clicking this section pops up the editor's Score Settings window. In this window you can choose the clef, possible values are Bass, Treble, both Bass and Treble, Tenor and Alto. The Octave setting can be used for instruments which are notated one octave off. The 8va bassa setting is suitable for bass guitar and double bass, for example. The Transposition settings can be used for transposing instruments like Bb clarinets. When both Bass and Treble staffs are used the Split Point setting determines which notes appear on either the Bass or the Treble staff. The Octave and Transposition settings aren't available in this case. The Key Signature is a value ranging from 7 flats up to 7 sharps. Key signature changes throughout the song can be programmed after clicking the Edit Changes link. Key signature changes always occur at the start of a bar. When any changes are present the left hand section shows the key signature of the first bar that's (partially) visible. 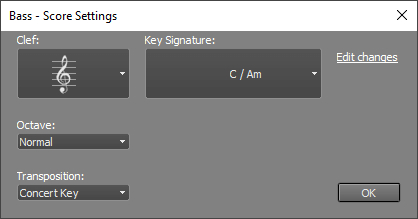 The key signature settings affect all MIDI tracks. It is stored in the MIDI files.